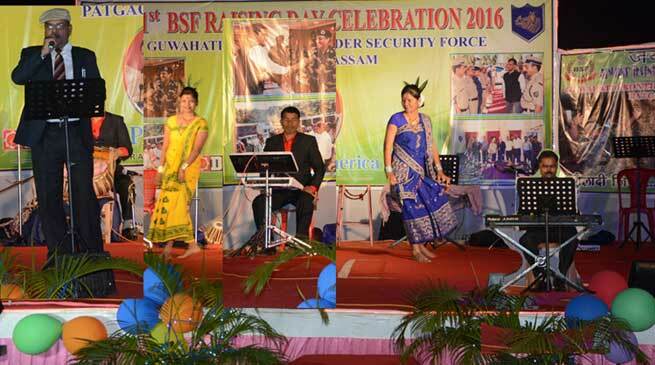 The Guwahati Frontier of Border Security Force (BSF) celebrated its 51st Raising Day with great pomp and show, at Patgaon, Guwahati, on 1st Dec 2016. The Border Security Force came into existence on 1st Dec 1965, to guard International Boundary (IB) on Indo-Bangladesh and Indo-Pak Border. Besides its primary role of guarding India’s IB during peace time, including prevention of trans-border crimes, the Force has been rendering yeoman’s service in maintenance of law and order and helping citizens of India during natural calamities. Contribution of BSF in maintaining integrity of India with its deployment in countering militancy in Kashmir valley is well known to all. Various events like Blood Donation Camps, Free Medical Camps, sports activities and cultural programmes were organised at Frontier HQ BSF Guwahati and the Sector HQrs at Dhubri, Cooch Behar and Falakata, in the run-up to this celebration. A customary Bara Khana was organised at every location of the Frontier followed by colourful cultural programmes which were witnessed by the Officers and Jawans, including retirees of the force.